It has been called the worst building in the world, a sign of North Korea's weakness and the closest thing humanity has every come to building a Death Star. 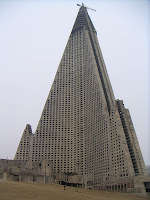 It is the Ryugyong Hotel in Pyongyang, North Korea. Construction on the hotel began in 1987, people suggest that the hotel was begun because Pyongyang wanted to co-sponsor the 1988 Summer Olympics with Seoul. Then-President Kim Il-Sung hoped that the hotel would be a kind of shining beacon of North Korean prosperity and the hotel began being featured prominently on travel brochures, promotional posters and postage stamps. Pictures of the hotel at night were even airbrushed to show the hotel lit up and in use despite not being close to completion. Unfortunately, most of North Korea's funds for the hotel came from the Soviet Union which collapsed in 1991 and construction was halted in 1992. Had the building been completed it would've, at the time, been the 28th tallest building in the world and the tallest hotel. The concrete hotel is made up into three wings, all of them angled at 45 degrees into triangles. The grounds have several gardens and pavilions surrounding the building and the hotel is the most prominent sight in Pyongyang's skyline. The hotel rises 105 stories up and has 3,000 rooms. At the top of the main pinnacle were supposed to be five rotating restaurants and an observation deck. Both remain unfinished and a construction crane sits atop the hotel and has remained up there since 1992. The Ryugyong, named after one of Pyongyang's historic names, sat untouched for 16 years before construction resumed again. Egypt's Orascom Group began refurbishing the top floors in April of 2008 and Orascom did reveal plans to begin creating a GSM infrastructure for 100,000 initial cell phone customers. Currently, only government officials are allowed to have cell phones in North Korea and use of a cell phone is banned for both citizens and tourists. At least one side of the hotel is now covered with glass as are the rotating floors at the top. A government official did say the hotel will be finished by the 100th birthday of Kim Il-Sung in 2012. Since 1992, the hotel has been left open to the elements and questions about it's safety has been brought into question. When construction stopped, people believed it was because the hotel was unsafe and would collapse if finished. 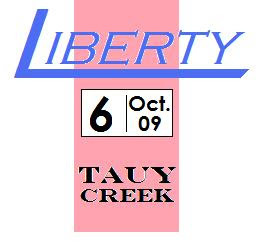 Now that construction has resumed, safety concerns have been brought up again. It's unknown if, when completed, North Korea will continue to use the building for a hotel or if Orascom will use it to house cell phone equipment and offices or just leave it abandoned. The thing that gets me are the nicknames the hotel has been given by people outside of North Korea. Had this hotel been completed, it would probably be a beautiful glass-covered building although I don't think it would be full very often because you don't exactly hear of people wanting to visit beautiful downtown Pyongyang. I'm wondering if the nicknames "worst building in the world" and "Death Star" are really deserving. 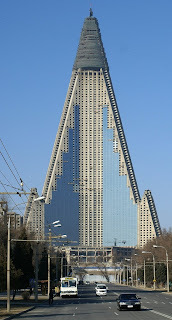 If the hotel was in the United States, Egypt, Dubai or just about anywhere else I think people would find the hotel an amazing feat of architecture but because it's in North Korea, it is mocked. If you take a look at the Google Maps satellite photo of the Ryugyong, a lot of work still needs to be done on the building and the surrounding land. If you pan around the city of Pyongyang you may notice something else. None of the roads are labeled in Google and there are few, if any, cars. It's hard to believe, even taking into consideration North Korea's lack of knowledge of the outside world, their country pride and heightened egotism that anyone there would think building a 3,000 room hotel was a good idea. North Korea only allows a certain number of people into their country every year and most of these people are from China and other parts of Asia and photography is strictly controlled as is interaction with local people. Another question is why North Korea didn't just tear down what had been completed on the hotel if it was such an eyesore and a black eye on their pride. Whatever the reason, I look forward to seeing the completed building--North Korea or not--and hope that it's not the folly everyone else is turning it into. We should reserve a room for our honeymoon! I hear Pyongyang is gorgeous this time of year.